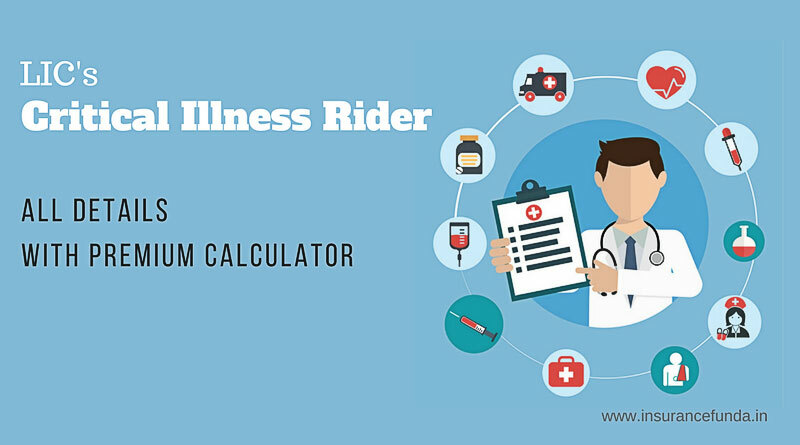 LIC Critical Illness Rider – All details with CIR Calculator. All the future plannings and prosperity of a family is largely dependant on one often ignored factor – health of the bread winner. Every body will agree that good health is required to earn. But often ignored factor is the expenses incurred to treat the illness and that too with reduced earnings. Situation becomes even worse if the affected disease is a major disease or in insurance terms Critical Illness. But the good news is that LIC’s New Critical Illness Benefit Rider can help you to reduce the financial burden, in case, the Life Assured is diagnosed as suffering from any of the pre-specified critical illnesses. This rider shall be attached with non-linked plans at the inception of the base policy and will provide an add-on benefit to the base plan. CIR Online premium calculator for all plans can help you to calculate and compare premium, with and without CIR benefit for all allowed plans. Premiums for all modes as per the data supplied by you is provided. Click the button given below to open Online – CIR Premium Calculator. Excludes: Cysts, Granulomas, Malformation of arteries or veins of brain, Heamtomas, abscessess, pituitary tumors, tumors of skull bones, tumors of spinal cord. A waiting period of 90 days will be applicable from the date of commencement of risk or the revival of risk cover which ever is later, to the first diagnosis of critical illness under consideration. A survival period of 30 days is applicable form the date of diagnosis of critical illness listed above. If death occurs within the survival period, Critical illness benefit shall not be payable.